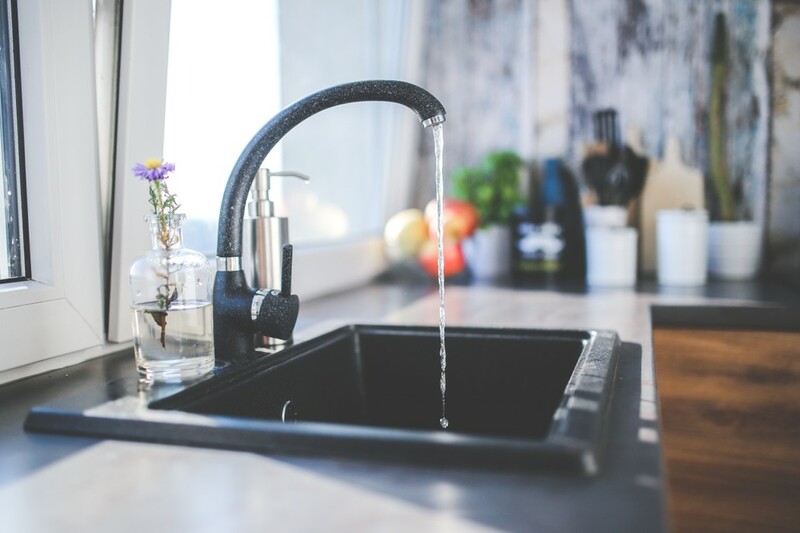 Take your sink from dull and hazy to clean and shiny with these five easy tips. Granite composite sinks have grown in popularity thanks to their look, price, and durability. Made by mixing fine granite sand and an acrylic resin bonding agent, this process creates a material that looks and feels very much like regular granite, but is easier to maintain, more durable, and less expensive. These sinks are also heat resistant, resist normal wear and tear that other sinks like stainless steel tend to show, and come in a variety of color options. Despite all these great things, a sink is a sink, and must be cleaned with regular use. 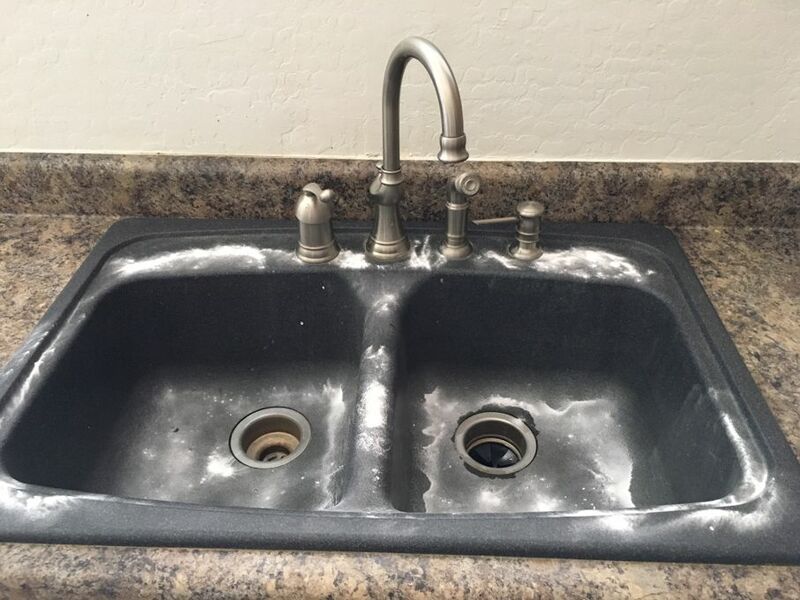 Granite composite sinks can be susceptible to stains from hard water or from harsh cleaning chemicals—these will cause the granite to appear cloudy or dull. 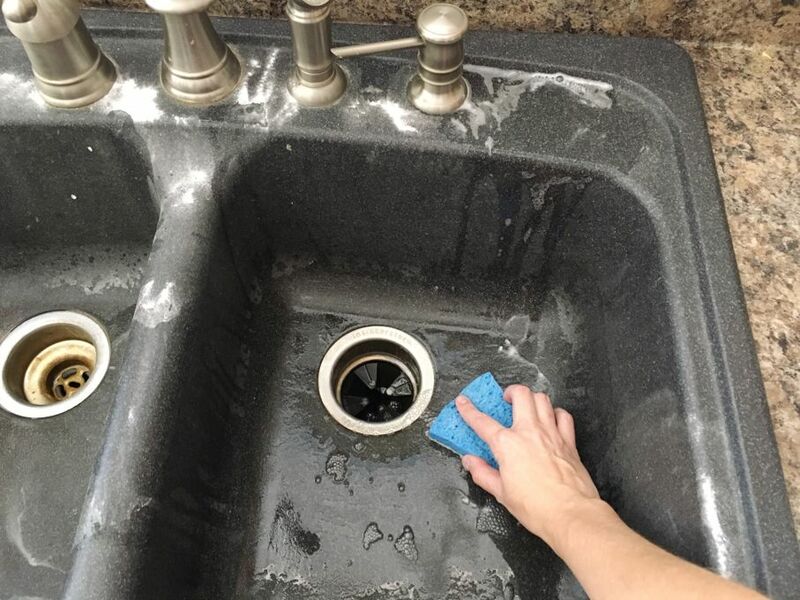 In this article we have an easy 5 step cleaning regiment to help keep your granite composite sink clean and looking new for years to come! The cleaning supplies for this are very simple and there's a good chance you'll already have these items in your home. You'll need: baking soda, vinegar, and mineral oil. That's it. 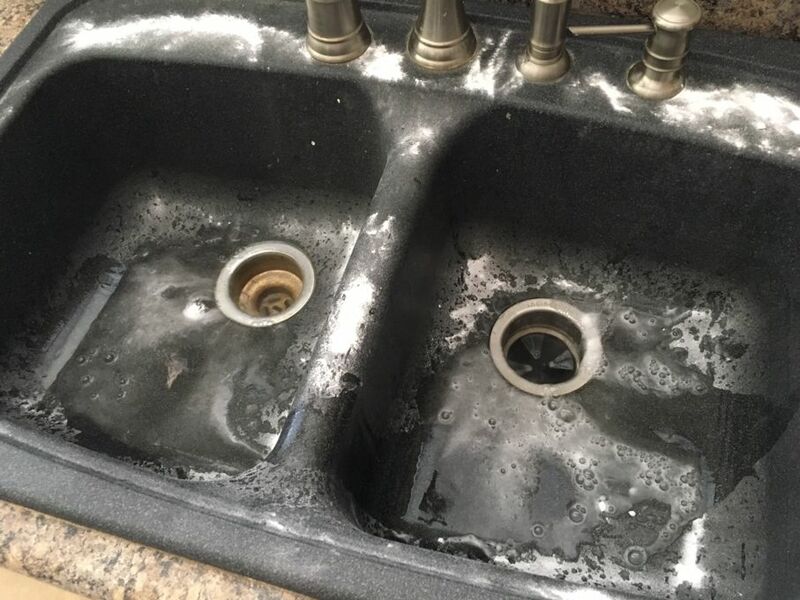 The baking soda and vinegar will work together to safely clean the granite while the mineral oil will come after and help renew your sink's luster. Granite can be very susceptible to harsh chemicals damaging the finish and weakening it over time, but this mix of household cleaners is safe. We recommend that the vinegar and baking soda solution not sit on the sink for too long, as the acidity of vinegar may work too well. If you have a few specific, trouble areas, apply the mixture directly to those areas and scrub. If you need a good all around clean, uniformly cover the entirety of the sink, but again, don't let it sit for an extended period of time. Be sure that you are using either a soft bristle brush or a soft cleaning rag when scrubbing the sink. Always avoid steel wool brushes or wire brushes as they will scratch the sink and leave long lasting damage. Before doing anything, the sink should be completely emptied as well as cleaned of any debris or food scraps. Flush with hot water and scrub down the whole sink with dish soap as well. After cleaning it out, dry it with a paper towel or dish rag. Sprinkle baking soda on any discolored or stained areas or all over if you need a full-on clean. Baking soda is mildly abrasive, but natural and safe so it is ok for use on a granite sink. Pour a small amount of white vinegar over the baking soda and allow the two to combine and fizz up. If you want to use less vinegar, a mixing bottle of half water half vinegar is also fine to spray on. Use a sponge or soft bristle brush and scrub the mixture into all the problem areas. These may include the corners where water drys up leaving hard water stains or around the drain. Once you've scrubbed enough, rinse everything off with warm water and again, dry everything off with a paper towel or soft washcloth. Once the sink is cleaned and dried again, you're ready for the final step. Even when clean, the granite can look dull; the mineral oil will bring back some shine to it. 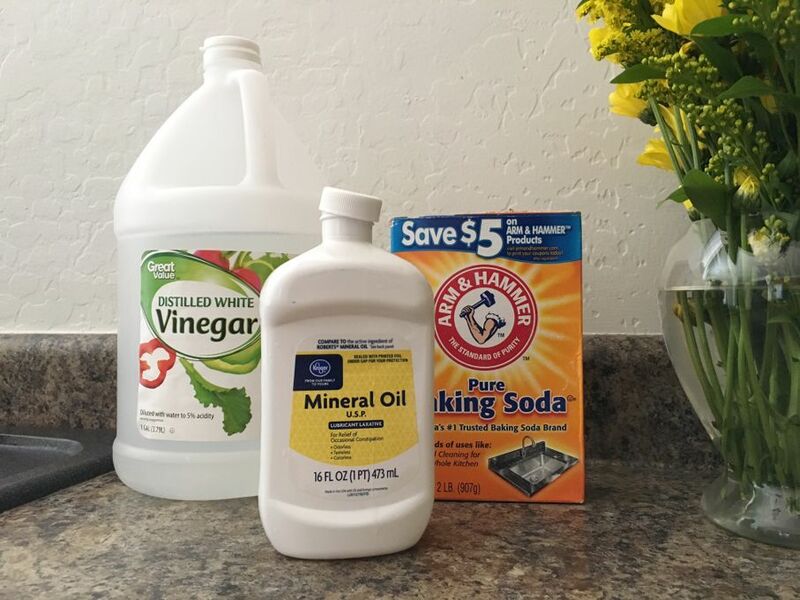 Pour about a tablespoon of mineral oil onto a soft cloth and buff the oil into the sink using a circular motion. You may need to add more oil as you go, just make sure the cloth evenly holds the oil so it doesn't get put on too thick. It's that easy! 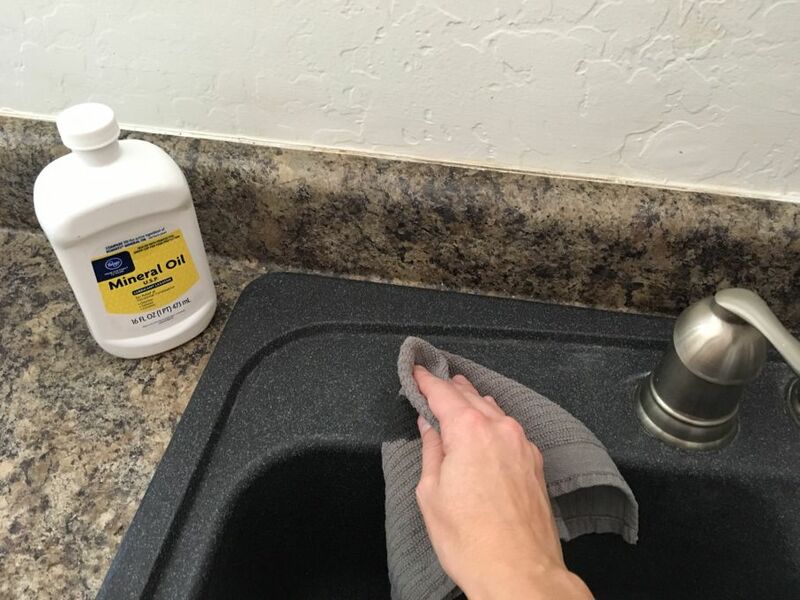 Following this regimen about once a week will keep your granite composite sink looking like new. 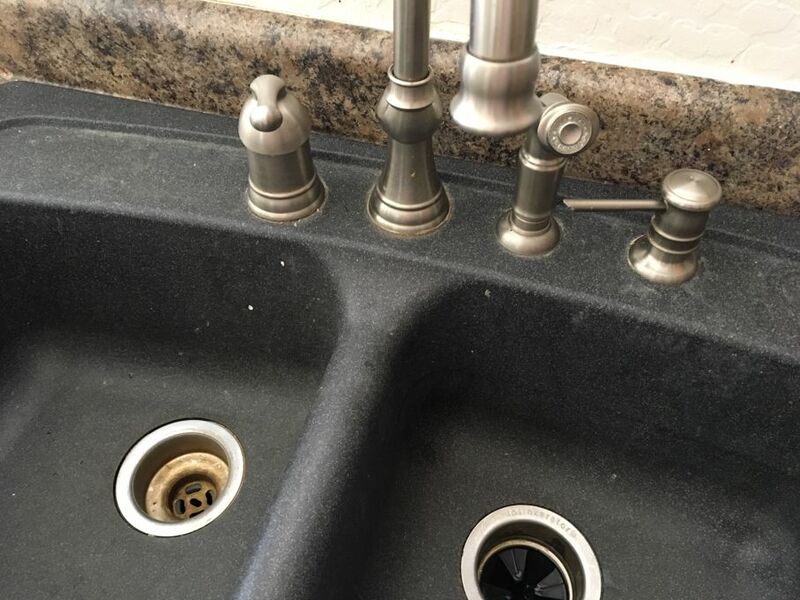 As long as you clean the sink with soap and warm water every few days you can even avoid having to do this cleaning as frequently. It's also beneficial to dry the sink after every use, as the water that rests in the sink can cause the cloudy buildup. 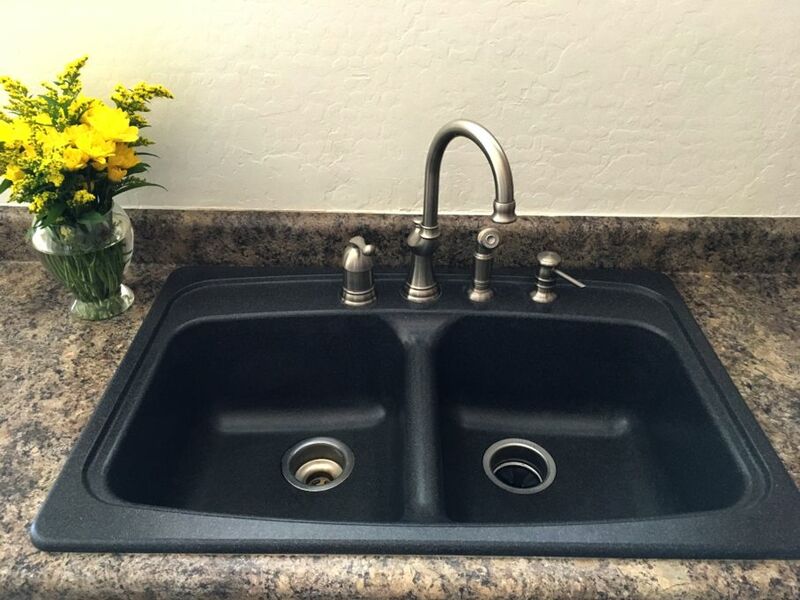 Granite composite sinks require a bit more work than some other sinks, but they do look stunning, especially when they've been freshly cleaned and shined! Images used with permission, courtesy of Erica Young.